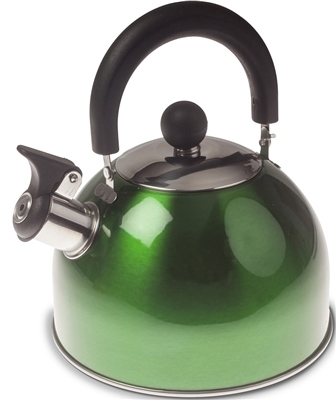 A stainless steel whistling kettle with 2 litre capacity. Designed for use on all types of camping and caravan stoves and solid hotplates. This item is sent to us in mixed colour cartons of Blue, Green and Red. If you would like a specific colour then please specifiy in your customer order notes at checkout. Stock depending we will always do our best to get you the colour you ask for. This kettle even fits on my wood stove, as it has a nice fold down handle. Nice looking kettle. Should look nice in our caravan. boils water looks great and whistles , what more can you ask !! !